Elena Hotel Complex in Elena Town in Bulgaria. 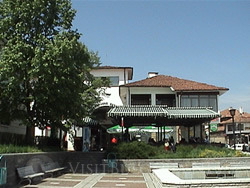 Location: Hotel Complex Elena is situated in the centre of Elena town. It combines cosiness, pleasant atmosphere and contemporary comfort. Accommodation: Complex Elena offers 2 single, 35 double and 15 triple rooms and three apartments. All rooms offer individual bathroom, and some of them offer TV and telephone. Hotel Elena is a three storey, two stars complex. It offers excellent conditions for relax, business meetings, family dinners, jubilee holidays, banquets and etc. During the holidays, and upon preliminary demand a full board and entertainment programs can be offered upon preliminary demand. Wine& Dine: Complex Elena offers a restaurant with 120 seats, mehana for 60 guests and open air bar cafй, for the summer season. Additional services: Hotel Elena offers laundry and dry cleaning, ironing, free use of the conference halls and currency exchange.